Laura Wallen, a pregnant 31-year-old Montgomery County woman, who was a schoolteacher in Howard County, was laid to rest Saturday. SILVER SPRING, Md. — A 31-year-old Montgomery County woman, who was a schoolteacher in Howard County, was laid to rest Saturday. Laura Wallen was four months pregnant when she was killed. She worked as a teacher at Wilde Lake High School. On Sept. 13, her body was found in a shallow grave in Damascus, Maryland, but police believe Wallen was killed on Sept. 3. Her boyfriend, Tyler Tessier, 32, of Damascus, Maryland, is charged with first-degree murder. The boyfriend of a missing, pregnant teacher from Montgomery County faces first-degree murder charges after she was found in a shallow grave. 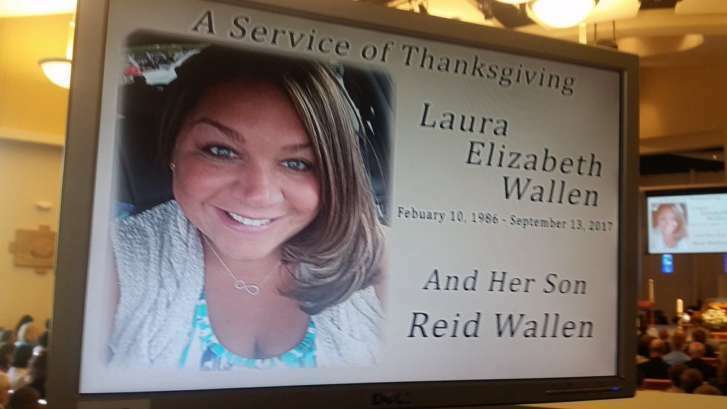 Funeral services for Wallen and her unborn son Reid Wallen were held at The Lutheran Church of St. Andrew in Silver Spring, Maryland, on Saturday morning. He told the attendees that their presence at the church was a major blessing to the Wallen family. Hricko said that Laura Wallen worshipped at the church nearly all her life and told those who were gathered that the church stands ready to help them in the coming days if they need support to get through this time of mourning. The community is still stunned by her death. Howard County Executive Allan Kittleman also attended the funeral. Wilde Lake High School Principal Rick Wilson read a passage from the Bible during the service. Laura Wallen’s father, Mark Wallen, spoke at the funeral. “Laura will always be our daughter and my little girl,” he said. He thanked Montgomery County police “for their tireless and selfless commitment to find our daughter and bring her home to us.” Wallen also thanked the Wild Lake and the Murray Hill communities in Columbia, Maryland, for supporting the family in the search of his daughter. He said his daughter considered herself a work in progress. The family said that those who wish to express their sympathy in the form of monetary contributions can donate to any of the three following organizations: The Lutheran Church of St. Andrew; In Honor of Her, which supports victims of domestic violence; Dream Outside the Box, an organization Laura was involved in that supports students in need.